"Henry" was VERY funny and the crowd laughed uncontrollably." "When Henry is looking around for the card at the end, it cracked me up." - Marsha J. 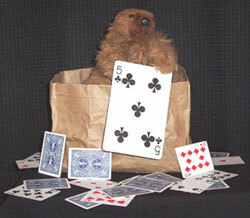 "When the cards flew out of the bag the children went crazy. It was like the 4th of July." 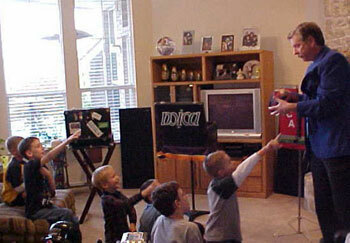 - Judy C.
"I feel it is a way to give your children, or even adults a show that they will remember for a lifetime. I would definitely use them again." 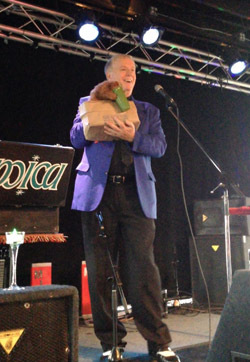 "The birthday boy's comments about the show were 'Can they come to my parties every year'." 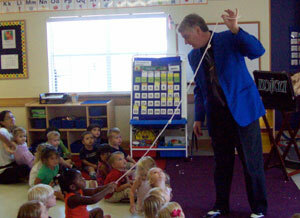 "They were not only funny and entertaining for the children, but also the adults." "All the parents were laughing at the end of the show, and commenting on how wonderful it was." 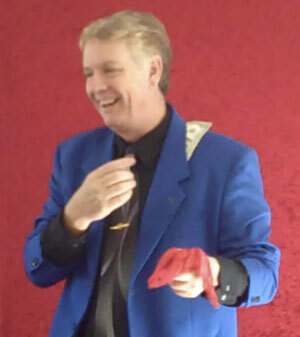 - Mica's puppet friend, "Henry," performs a card trick that has adults and children rolling with laughter. By the time the trick is finished there are cards all over the floor. And yet Henry manages to save the day and still produce the card previously chosen by a member of the audience. 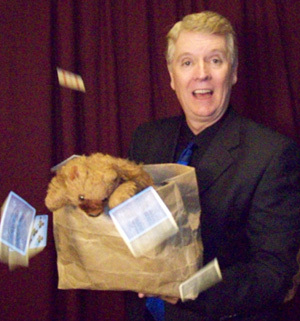 Dallas, Ft. Worth, Denton Magician, Mica Calfee, performs all over North Texas and beyond. 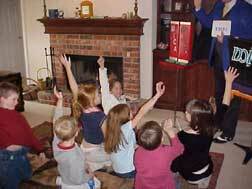 The children will be engaged, challenged, entertained, and involved. We will have them excited and involved. 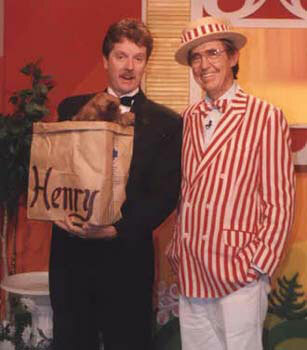 Your children will love Mica and his magic puppet Henry! Children's magic that adults can love too! 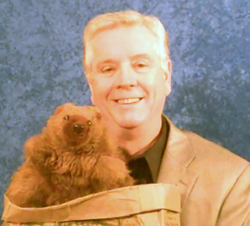 "Judy and Mica, the show was great tonight at the Colleyville Library. 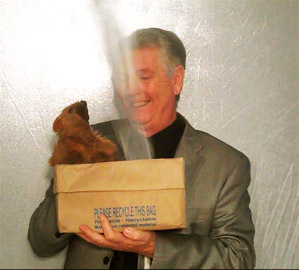 Very entertaining!" 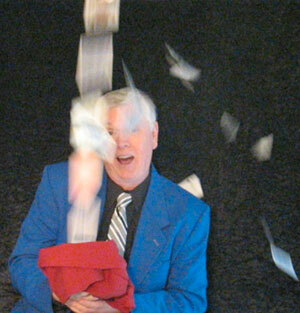 Mica's show is a laughing, cheering, high energy show full of amazement, audience participation, and fun. "The perfect choice for your Blue and Gold banquet." 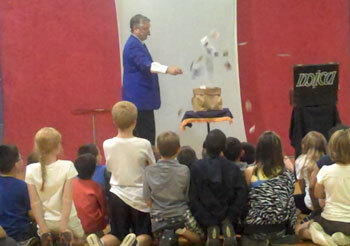 In Mica's magic shows the audience is part of the fun. Many of the routines have built-in moments where the audience "thinks" that they have figured it out. The children are subtly encouraged to tell Mica where he has messed up. This adds to the fun of the children trying desperately to show him how they have seen through his apparently feeble attempts to trick them. Once Mica does understand what they are trying to tell him, he reveals that there is even more to the trick than anyone could have imagined. 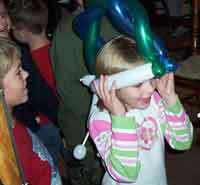 Both the children and the adults are always amazed and entertained. around age 6 and above. Cub Scout Blue & Gold Banquets. 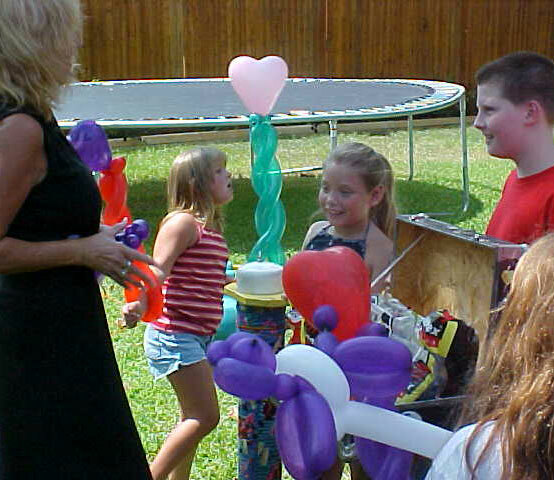 Each of Mica's magic birthday party shows will often include "Balloon Sculptures" afterwards. We recommend this for several reasons. 1. It can be a party favor for the guests to take home. 2. It is more than just balloons. This is almost another show by itself. 3. The fun does not stop once we are gone if there are still things to play with or show to others. Our goal is to make YOUR event a success and talked about. 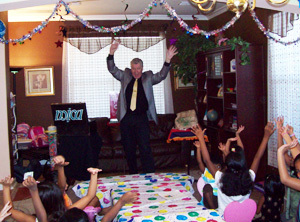 Mica is the magician often chosen to entertain children in Lewisville, Flower Mound, Frisco, Plano, Highland Village, Colleyville, Southlake and elsewhere.